The TaxCapDev-network also hosted a panel on taxation and resource extraction during the EADI-conference where Morten Bøås from NUPI was co-chair. 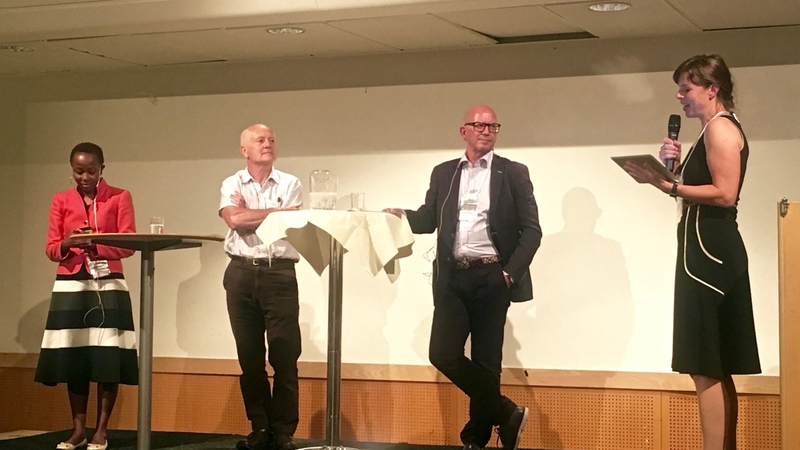 The plenary session “Globalisation and international tax justice” took place on 22rd of August as part of The European Association of Development Research and Training Institutes (EADI)- conference in Bergen from 20-23rd of August. The session was hosted by the TaxCapDev-network, and the network was represented by Sigrid Klæboe Jacobsen from Tax Justice Network – Norway as chair, and Professor Odd-Helge Fjeldstad from CMI as one of the main speakers. In addition, the panel consisted of Professorial Fellow Mick Moore, CEO of International Centre for Tax and Development (ICTD), UK, and Associate Director Catherine Ngina Mutava Strathmore Tax Research Centre (STRC), Nairobi. The aim of the plenary was to present and discuss research frontier on tax haven and international taxation with an emphasis on developing countries. The focus was further centered around African countries in particular, as the panel consisted of researchers conducting their research in African countries. 1. The skewness in the development of international tax laws. – Tax treaties were first signed in the 1890’s between Germany and Austria. In the 1890’s – people in Kenya were dancing! Not developing international tax law. There is a Nigerian saying: If you don’t come to the table, you are on the menu. The African countries were not aware of the table. And by the time they came to the table, the big boys were already there, tells Cathrine Ngina Mutava from Strathmore Tax Research Centre (STRC) in Nairobi. – For instance, since independence, no flower farms have paid taxes in Kenya, although Kenya is one of the major flower producers in the world, she continues. The Organization of Economic Cooperation and Development (OECD) launched their BEPS Action Plan in October 2015 which provides 15 Actions that equip governments with the domestic and international instruments needed to tackle Base Erosion and Profit Shifting. This is the most ambitious and comprehensive regulations for international taxation this far, making OECD the leading institution for developing international tax laws. However, there are major concerns from lower-income countries that the OECD-led initiatives do not reflect their particular needs and circumstances. – The BEPS process has tended to produce reforms that either favour OECD interests or fail to address the concerns of lower-income countries, Odd-Helge Fjeldstad. This raises the question if there’s a need for a world organization for tax issues. G77 + China advocates for the expansion of the UN tax committee into a global tax body, but this has so far been turned down by OECD countries. Countries like the US and the UK are saying that the formation of a UN tax body could undermine the work being done by the OECD and that the OECD Inclusive Framework initiative for tax cooperation sufficiently includes non-OECD members. Mick Moore argues however that the attitudes of the OECD have changed considerably. – The OECD is a “club of rich countries”. But they have increasingly been aware that non-OECD member states are increasingly important and the OECD have taken measures to make the processes open for non-members. Through this, the OECD have taken steps towards taking the role of a world tax organisation, argues Mick Moore. – The damage done to African tax collection is not attributable only to problematic international rules, but also to the complicity of some African governments and officials in facilitating tax abuse. For instance, many African elites – including some political leaders – hold significant wealth offshore. Their influence may lead African states not to join the international initiatives at all, or to fail to use the information they do obtain, says Fjeldstad. This affects the people’s attitudes towards domestic taxation as well. Research done by researchers at CMI in Bergen, finds that information on self-serving elite behavior in Tanzania has either no, or a negative effect, on political participation, but in fact undermines confidence in political institutions and faith in the social contract among the population (Kolstad and Wiig 2017). – Additionally, in many countries, wages and incomes are so low that it doesn’t make sense to introduce personal income taxes. It is mostly civil servants and people in the formal business sector who pay personal income tax, but the poor pay substantial fees, bribes, indirect taxes etc., tells Cathrine Ngina. What now for tax challenges in Africa? Focus on implementation of BEPS reforms that will clearly generate increased revenue considering limited administrative resources available in most African countries (Michael Durst, ICTD WP 2015). Reducing loopholes within domestic law to avoid multinational tax evasion.